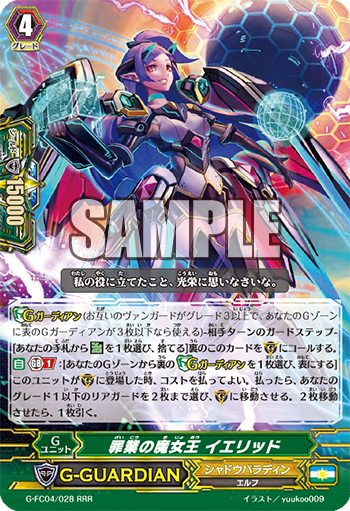 AUTO Generation Break 1: [Choose 1 face-down G Guardian from your G Zone, flip it face-up] When this card enters the field, you can pay the cost. If you pay it, choose up to 2 of your Grade 1 or lower Rear-guards, move them to (GC), and if you move 2, draw 1 card. For Today’s Card, we’re introducing the following from “Fighter’s Collection 2017” (on sale May 12th, 2017): The Generation Break 1 《Shadow Paladin》 G Guardian, “Witch Queen of Sin, Yelidd” and the Heal Trigger “Witch of Heresy, Yelidd” that activates its ability when it’s discarded from the hand for the Cost of Calling the related G Guardian. The G Guardians included in “Fighter’s Collection 2017” have the common components of Generation Break 1 and “Flip a face-down G Guardian face-up”. Compared to normal G Guardians, because these have a “Timing delay for when you can use them” and “Decrease the chances to use a G Guardian by flipping a G Guardian face-up as part of the cost”, they also are much stronger than typical G Guardians, and have incredibly high Defense. These are indeed special G Guardians! And on top of it, the Heal Triggers in “Fighter’s Collection 2017”, available to all clans, have abilities that activate when they’re discarded from the hand for the Cost of Calling the G Guardian of their clan that’s included in “Fighter’s Collection 2017”! They have varying abilities depending on their clan, such as hand cycling or cost recovery. When “Witch Queen of Sin, Yelidd” is placed on the field, you can move up to 2 Grade 1 or lower ally Rear-guards to your Guardian Circle, and if you move 2, you draw 1 card. When it’s a Grade 1 or lower, as long as it’s such, it can be used as a Guardian regardless of it being a Front or Rear Row card, and if you Call 2 Grade 1s as Guardians, you should have at least 25000 Guard and get to draw 1 card. On top of that, we’re introducing “Witch of Heresy, Yelidd” activates its ability when discarded from the hand for the Cost of Calling “Witch Queen of Sin, Yelidd”! By discarding a Grade 1 or lower card from your hand, you can draw 1 card. With this, you can easily achieve the usage the Shadow Paladin Clan ability, 【Ritual】. Even if you don’t meet the Generation Break 1, you can Call “Witch Queen of Sin, Yelidd”, so aggressively discard Grade 1s early on. Q. Can you discard “Witch of Heresy, Yelidd” for the Cost of Calling G Guardians other than “Witch Queen of Sin, Yelidd”? Q. Can you Call “Witch Queen of Sin, Yelidd” while you have no face-up G Units? A. Yes, you can. However, since Generation Break 1 hasn’t been achieved, you cannot activate abilities. Q. When there are 3 face-up G Guardians in your G Zone, can you activate the effect of “Witch Queen of Sin, Yelidd” by flipping a G Guardian face-up?